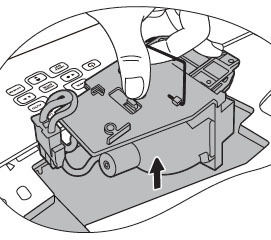 Follow this 3 step-by-step guide to replace the BenQ 5J.J0405.001 lamp in your BenQ MP776 projector. 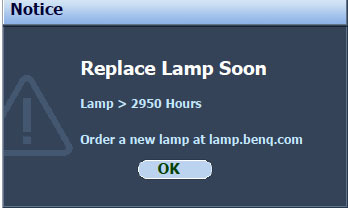 The Internet has been swamped with companies selling generic, compatible BenQ 5J.J0405.001 lamps. Each of these copy-cat manufacturers claim their product is equal to an OEM lamp. Knock-off compatible lamps will never be as good as the original lamps and using them can harm your projector. Created with carcinogenic, toxic substances as well as inferior parts and shoddy workmanship makes these generic lamps vulnerable to explosions. Not only will these counterfeit generic lamp compromise your health and safety, installing one will void any warranty for your BenQ MP776 projector. 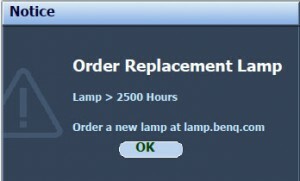 Spend the few extra dollars for a genuine OEM lamp. You’ll also be getting a BenQ 5J.J0405.001 lamp that helps your projector to work at its optimal level along with a money-back guaranty should there be any problems. Most OEM manufacturers also offer tech support. Educate yourself and learn how to spot a counterfeit lamp so you can buy authentic. First warning: The BenQ 5J.J0405.001 lamp has been in operation equivalent to 2500 hours. Install a new lamp for optimal performance. 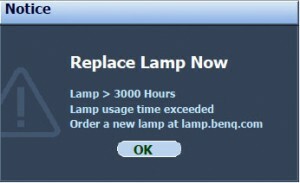 If the BenQ MP776 projector is running in Econo Mode, you have up to 2950 hours before changing the lamp. Final Warning: The BenQ MP776 projector has shut down and the BenQ 5J.J0405.001 lamp MUST be replaced before the projector will operate normally. 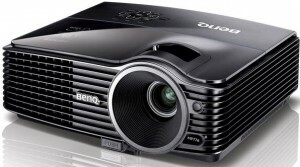 IMPORTANT NOTE: The BenQ MP776 projector operates at an extremely high temperature. 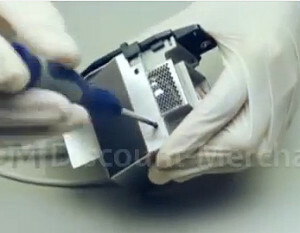 Let the projector cool for a least 45 minutes before replacing the BenQ 5J.J0405.001 projector lamp. The projector should be cool to the touch. Don’t rush it or you may end up with a nasty burn. 1. Turn the power off and disconnect the BenQ MP776 projector from all power sources. 2. Loosen both screws found on either side of the BenQ MP776 projector. 3. Remove the lamp cover from the BenQ MP776 projector. 6. Loosen the screw holding the lamp in place. 7. Lift the handle so that it stands up. 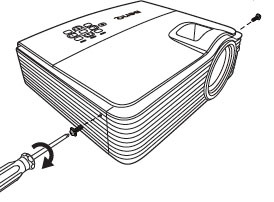 Using the handle, slowly pull the BenQ 5J.J0405.001 lamp out of the BenQ MP776 projector. Pulling out too quickly may cause the bulb to break. If this happens go to: What to do when your projector lamp explodes. 9. 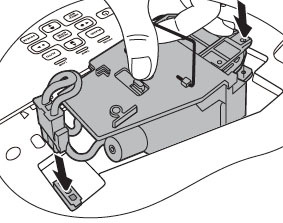 Tighten the screw that secures the BenQ 5J.J0405.001 lamp. NOTE: Loose screw may cause a bad connection, which could result in malfunction. 10. Ensure the handle is fully laid flat and locked in place. 11. Replace the new protection film that comes with the new BenQ 5J.J0405.001 lamp. 12. Replace the lamp cover on the BenQ MP776 projector. 13. 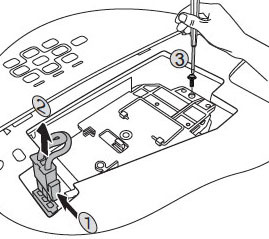 Tighten the side screws on the BenQ MP776 lamp cover. 14. Turn the BenQ MP776 projector on. 15. Reset the Lamp Timer. It’s important to reset the Lamps Settings menu in order for your BenQ MP776 projector to accurately track the life of your newly installed BenQ 5J.J0405.001 lamp. 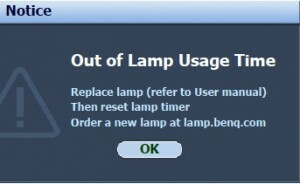 Failure to properly set the lamp can result in the projector stopping suddenly. 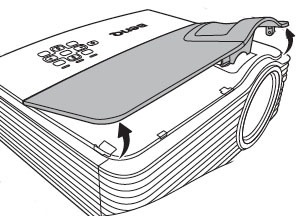 Use the Econo mode on the BenQ MP776 projector and set to Economic Mode to reduce the amount of power used but extend lamp life. I use a MP776 for a club, when I connect to computer, lamp REED light comes on, power light flashes Orange and the Projector lamp goes off, lamp meter say about 220 hours. Any ideas? There are white dots down right hand side and bottom RH corner of display, believe that is a faulty chip. It sounds like your projector lamp is finished. I would try replacing the lamp first and see if that takes care of the problem including the white dots. Keep track of the dots and if they keep growing across the screen that may be your color ballast. Hope this helps.